“Mensch”, a Jewish South African social change organisation, “painted the town green” for International Mitzvah Day 2018. At Mensch’s core is a network of Jewish people working or volunteering in transformation work in South Africa. 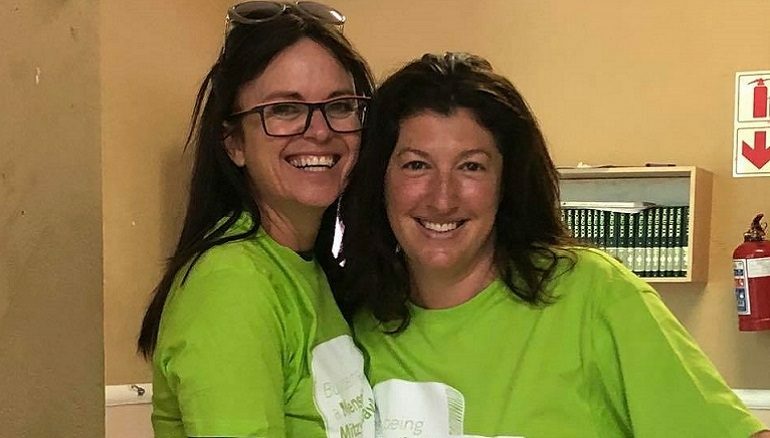 Because of this Mensch was well placed to activate 29 projects, bringing together 850 volunteers, who gave their time to serve 2500 people all over Southern Africa, in the first ever community-wide Mensch curated Mitzvah Day…and it was a resounding success! Following initial discussions in August this year, the team at Mensch pulled out all the stops to create and launch Mensch Mitzvah Day, which was then introduced to the community via a six week social media and face to face campaign, Mensch developed a ‘Mensch Mitzvah Day’ website, ‘Mensch Mitzvah Day’ branding, info-videos by a top South African comedian, individualised artwork for each event, and most importantly the creative input of making each mitzvah project unique and innovative… and ensuring that Mensch connected volunteers and beneficiaries with a view of them building deeper relationships beyond the day. Projects ranged from a group of friends donating blood, to an interfaith group cooking vegetable soup for a homeless shelter. From a Jewish welfare house beautification project, to the Progressive Community of Johannesburg making and giving sandwiches to those living on the streets of downtown Johannesburg. ‘The Kids Gym’ hosted a ‘Jump for Joy’ party for children with neurological challenges, while around the corner a Chabad community hosted a ‘Moms Pamper Party’ for refugee woman. The elderly from various communities enjoyed tea on the terrace, games on the go and cupcake decorating, and the homeless from NGO, ‘Souper Troopers’, were the treated to a “Soccer-in -the -Sky” tournament at “Fives Futbal’s” fabulous rooftop courts. Temple Israel Cape Town took members to work at the Umthunzi Farming Community in the Township of Gugulethu, planting and harvesting organic vegetables. They helped raise awareness of this community and have grown the number of regular customers buying their super fresh veggie boxes. Rubi’s Rainbow of Hope arranged a collection of Christmas food packs for 250 kids, who will now become beneficiaries of future collections. Cape Town Torah High (CTTH) introduced their learners to Mavis’s early childhood development centre in Mfuleni, a township outside Cape Town, for some student led educational fun and challah baking. The schools will now work together more closely. NGOs Shine Literacy and educational care centre Sakhai Isizwe, were the recipients of over 500 gently used books collected by Herzlia School learners. Another Herzlia School project run with The Union of Jewish Woman (UJW) arranged a fun day of football, netball and lunch for sixty kids from the Noluntu Food Kitchen in Khayelitsha. Mitzvah Day will now be built into Herzlia’s social outreach programme. The Board of Deputies (Cape Council) invited Ward Counsellors and The Deputy Mayer who visited and participated in four events.